Make these Sparkly Flower Snowflakes to decorate your holiday tree or gifts! The possibilities are endless on how to use these quick and cute snowflakes. Find Sparkly Flower Snowflakes On Raverly! 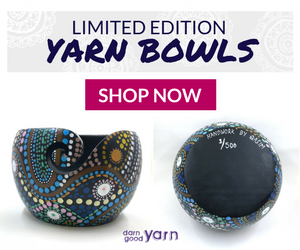 LOOKING FOR SPARKLY YARN ONLINE? FIND MORE PATTERNS FOR THE Mini Christmas Cal 2018 HERE! RND 2: (CH 4; SKIP next DC; SL ST into next DC) x 6 times; SL ST into DC of first 4 CH. SL ST into space between SC. RND 4: (CH 5; work 1 SC into next Picot; CH 5; SL ST into space between next 2 SC) x 6.